On 15 acres, with dual tees. Well maintained. Thick undergrowth and challenging layout. 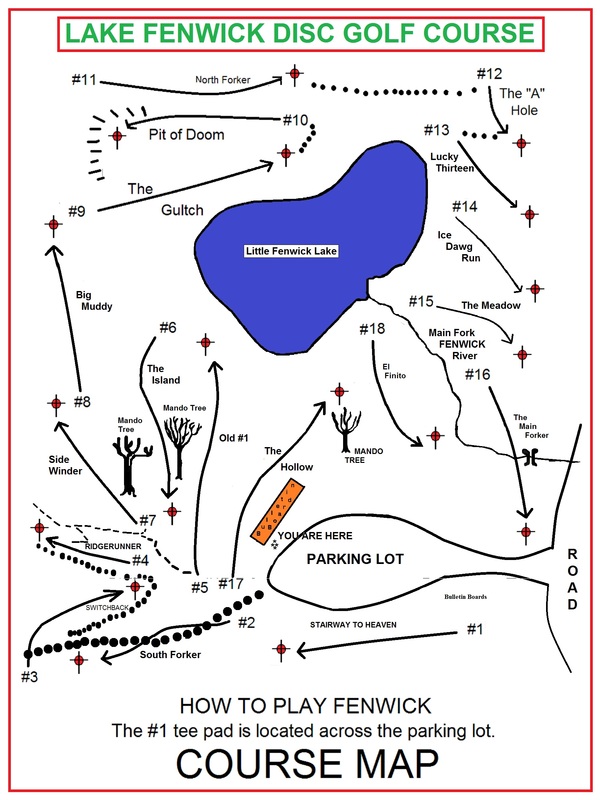 Map needed for navigation - posted here and near 1st tee. Limited parking and no restrooms (port-a-potties across street near the boat ramp). Bugs in summer, and stays wet after a good rain. From Seattle; south on I-5 to the S. 272nd St. exit, go east (left) 1 mile to a left on Lake Fenwick Rd. (near bottom of hill), 0.75 mile to bottom of hill. Course is on the left (Lake Fenwick Park on the right). Many pin locations are now deeper than they used to be. They are trying to cut down on the -15 scores that seem to come up during Random Flips there. Holes 1, 2, 5, 6, 16, 17, and 18 are all in new or deeper locations. On hole 6, there is a "island" area that is CLEARLY marked with new rocks and materials that have been laid down. Although it is a short shot, if you miss the island, there is a "drop zone" pad located on the left side of the fairway. On hole 16, you have a tricky but fun shot. When looking from one of the tee boxes for this hole, the pin is located under a big green tree on the right side of the fairway. It is VERY hidden but a very make-able shot. DO NOT shoot at the pin located near the parking lot. That is the 18th pin. All in all, this course is FUN!! Big arm shots to go along with some straight on and trick shot holes makes it challenging and fun to play over and over. Course is located in a marshy area. It winds clockwise around a swamp area. The bugs are bad and it can be very muddy. The design is nice and challenging. It takes advantage of the elevation that is available. It can be difficult to follow but there is some limited signage. Plenty of parking.